Rajasthan (राजस्थान) is the geographically largest state in northwestern India. 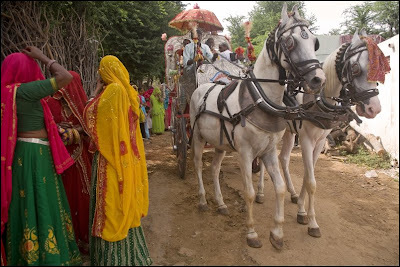 It borders Pakistan to the west, Gujarat to the southwest, Madhya Pradesh to the southeast, Uttar Pradesh and Haryana to the northeast and Punjab to the north. 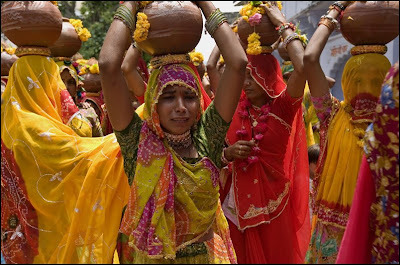 Indian women during a ceremonial for a defunct woman. 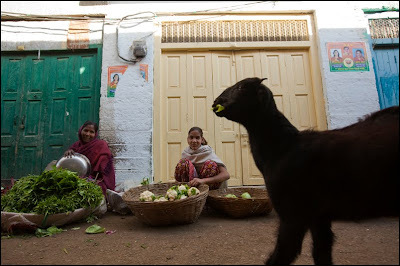 A goat taking advantage of the market in Udaipur. 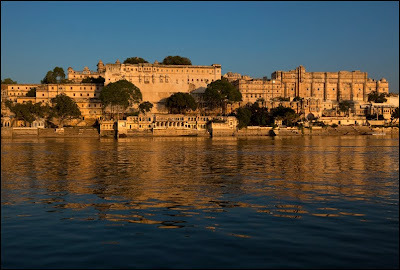 The Palace on Lake Pichola. 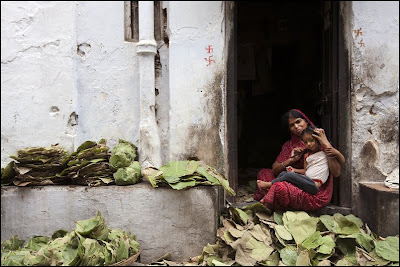 In a street of Udaipur. 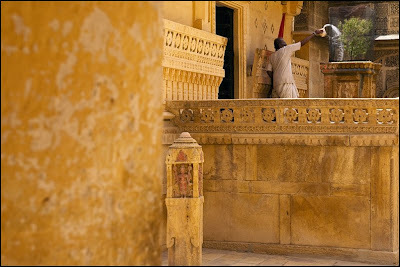 A Rajasthani woman going to work inside the fort of Jaisalmer. 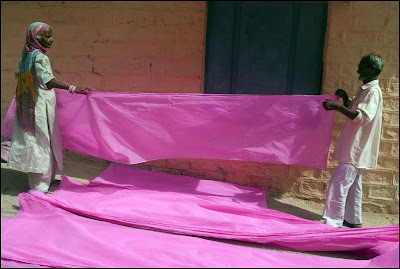 A couple folding newly dyed saris in Jodhpur. 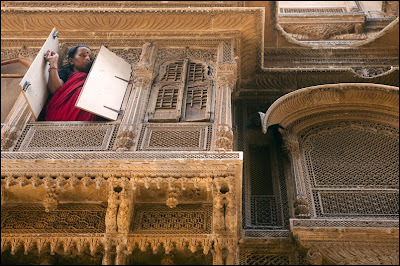 Amla, in front of her house in the city of Jaisalmer. 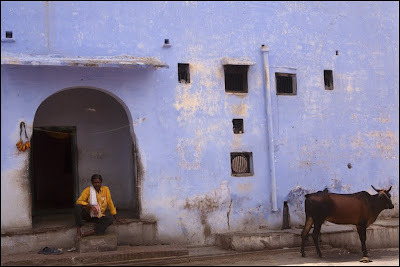 A Rajasthani man resting in front of his home in Jodhpur. 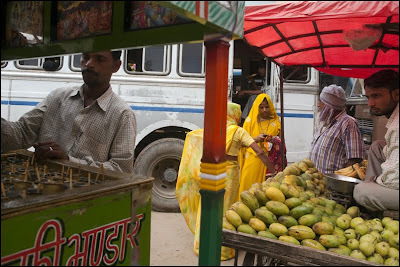 Waiting for a bus in Nawalgargh. 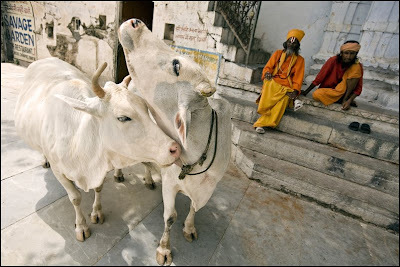 Can't wait to be in such a situation ! 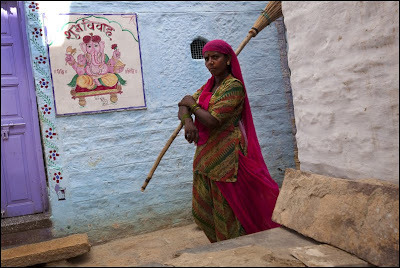 A Rajasthani woman making Millet chapatis inside her kitchen in a little village south of Jodhpur. 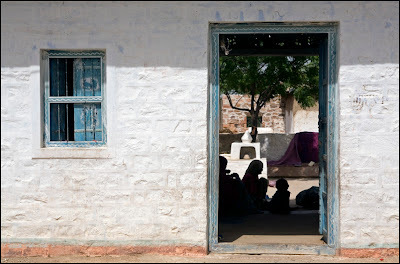 A family sitting inside the courtyard of their home in a little village 30km south of Jodhpur. 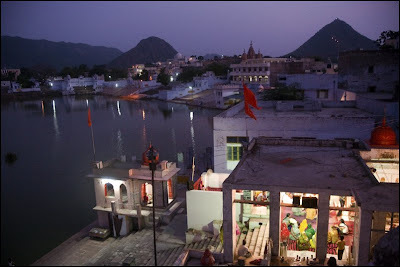 A night Puja in a temple located underneath the terrasse of my room in Pushkar. 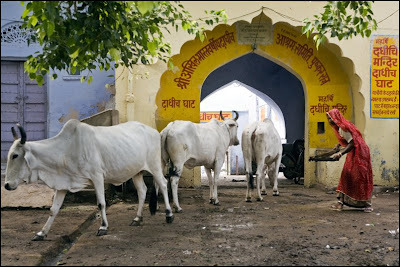 At the far right of the image on top the hill, the Sarasvati temple. 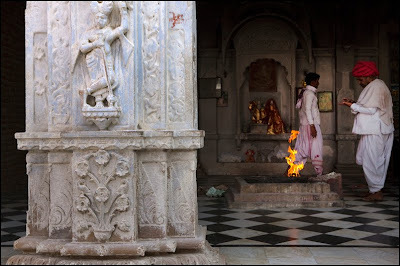 A pilgrim drying his dhoti on a cane while walking toward the Brahma temple in Pushkar. 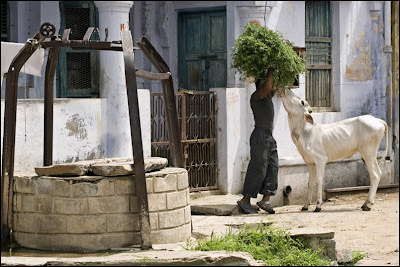 At the restaurant in Osiyan. 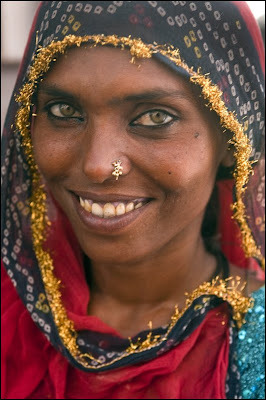 Another portrait of Papu, a well know Pushkar woman. 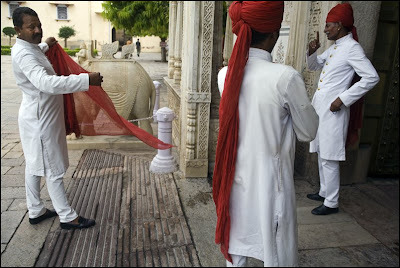 Door keepers inside the Maharaja palace in Jaipur. A priest watering a Tulsi tree in front of a temple in jaisalmer. 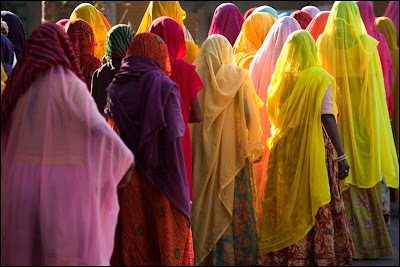 Rajasthani women shopping in a street of Jodhpur. 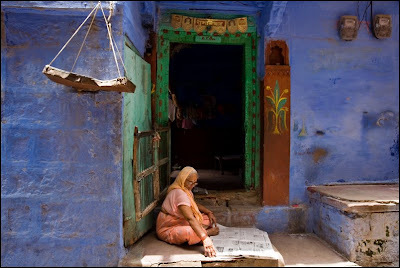 A woman resting inside the Palanquins room of the Meherangarh fort in Jodhpur. 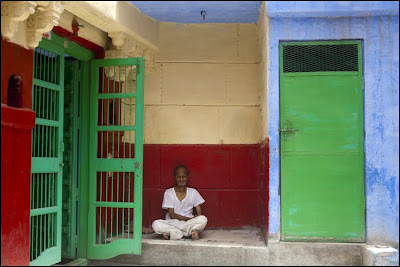 A beautifully maintained fort well worth visiting. 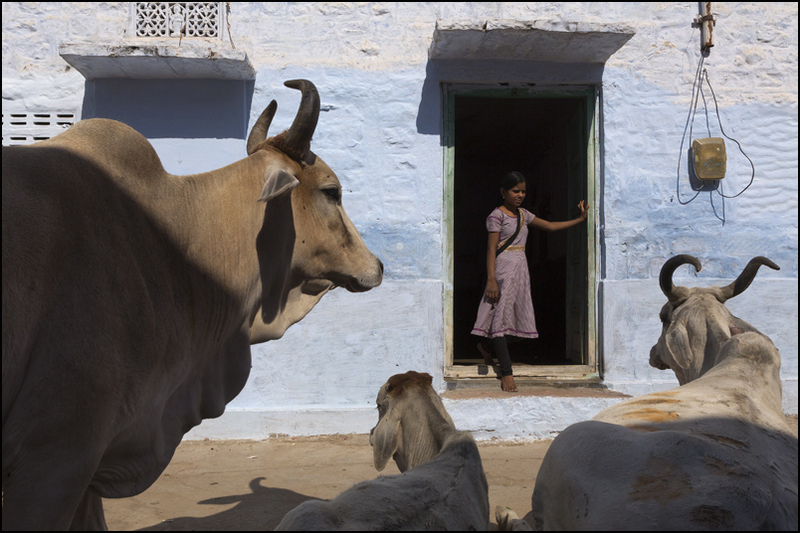 In a street of Pushkar, a Rajasthani woman picking up cowdung next to her house, an eco-friendly fuel. 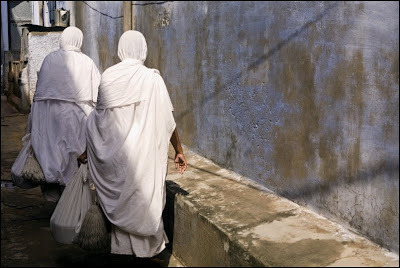 Jain nuns looking for a house where to spend the night in Pushkar. 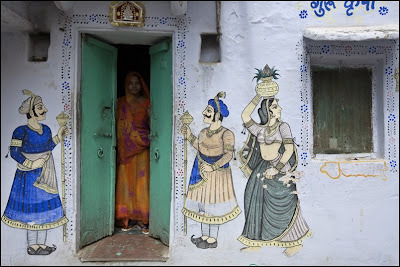 A nice Ganesh on a House wall in Udaipur. 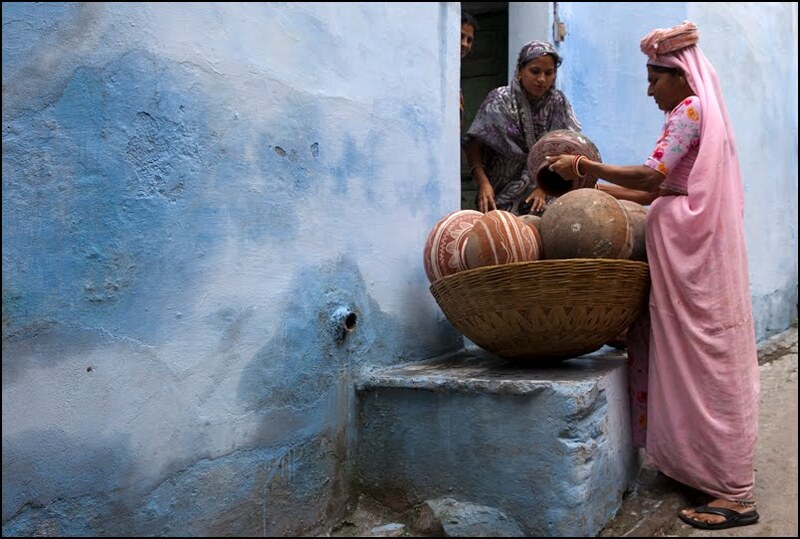 Doing the dishes in Udaipur. 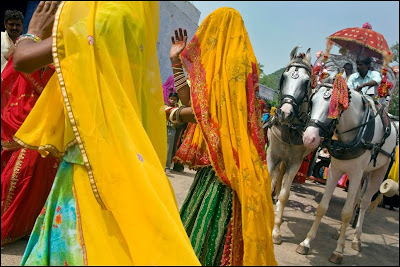 Rajasthani women going back home after a ceremonial where the family went from their home to he sacred lake with the gods from their home temple. 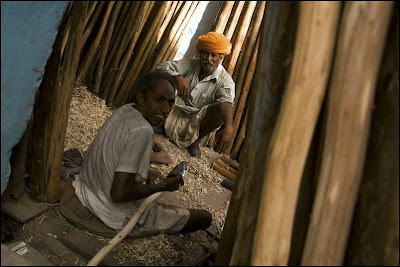 Working in a bamboo shop in Jodhpur. 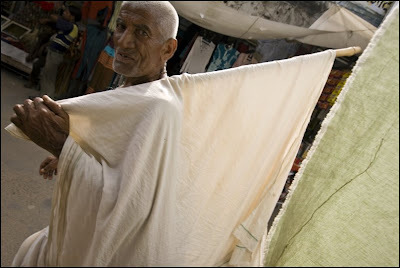 A Rajasthani ironing cloth in a street of Jodhpur. 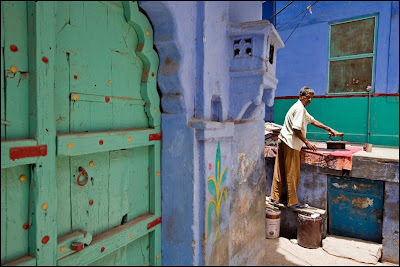 The tiny streets behind the fort are so nice to get lost in ! 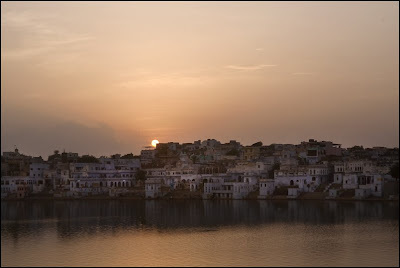 Jodhpur is a jewel. 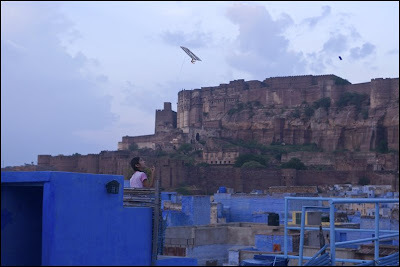 A little girl flying a kite at night in front of the Jodhpur skyline, Meherangargh fort in the background. 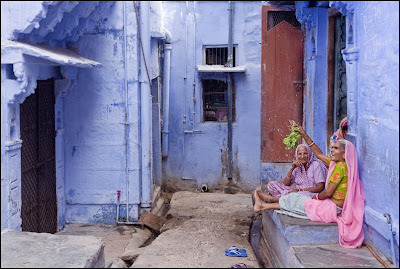 Indian women talking "veggies" with her friends in a jodhpur's street. 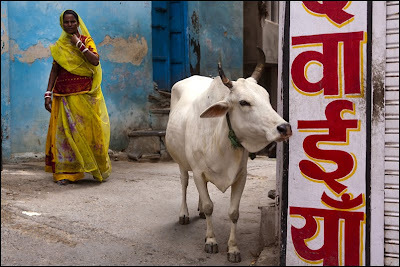 A Rajasthani trying to escape a Holy cow in a street of Pushkar. For the French speakers / Pour les Francophones un interview pour le Flickr Blog, December 17th. 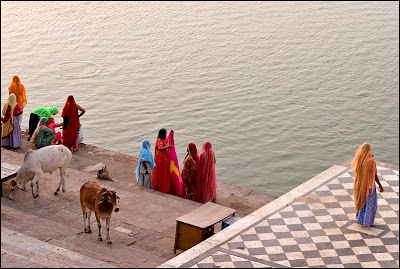 Women on the Ghats in beautiful Pushkar. 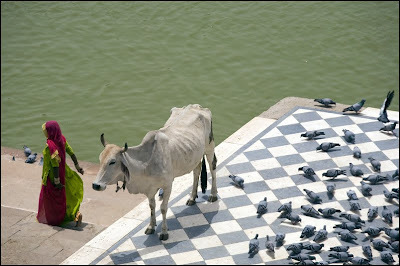 I shot this before this one.The white cow on the left will climb on the platform next to the woman in orange and blue, then a man will come next to them in the water..
Holy cows on the ghats in Udaipur. 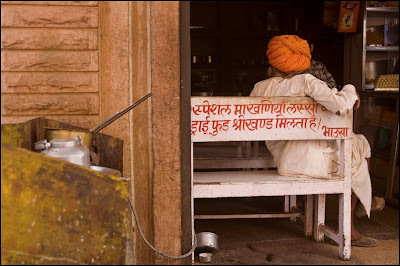 Sadhus are watching! 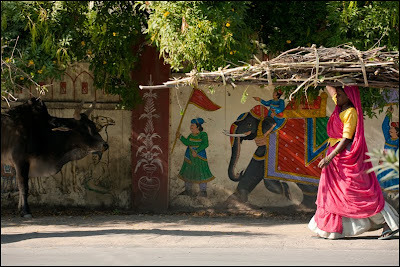 A big procession from the home temple to the sacred lake in Pushkar. 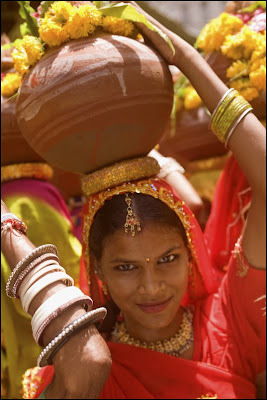 The women are coming back from the Holy lake, The band is still playing. 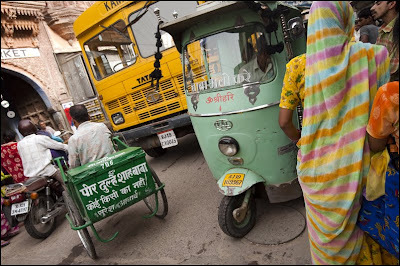 Those people are sitting in a cart that will be pulled throuhout the streets of Pushkar, all the family will follow the cart. 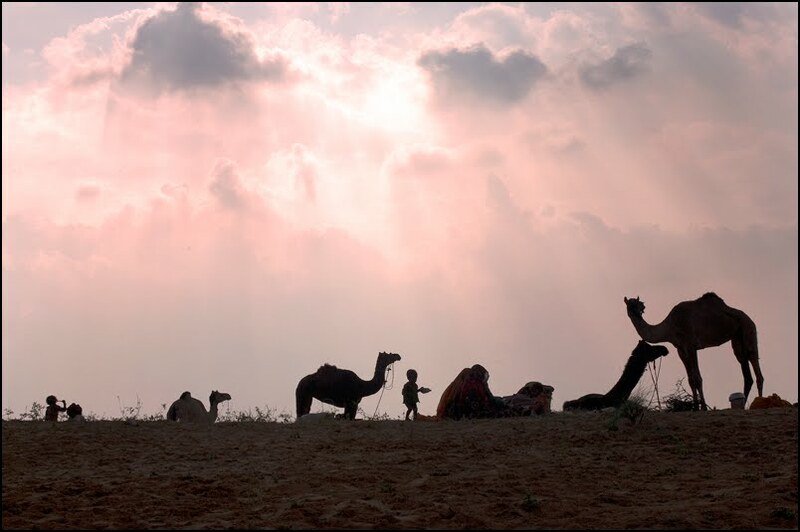 The band will open the road. A follow up of the previous image.